Oxygen/O2 is critical - your brain depends on adequate oxygen/O2 more than any other part of your body. As you age, this becomes more and more an issue. Flood your body with more oxygen! No green oxygen/O2 bottle on wheels that needs to be refilled. Your Personal Portable Oxygen/O2 Bar Concentrator provides the HIGHEST OXYGEN/O2 OUTPUT of any non-medical personal oxygen/O2 concentrator on the market! This new technology produces 41% oxygen enriched air at 3 LPM, which means this unit offers 100% more oxygen than the oxygen/O2 level in the air you normally breathe! Your Personal Portable Oxygen/O2 Bar Concentrator filters dust and delivers 40% (+/- 2%) oxygen/O2 enriched air at 3 LPM (liters per minute) with quiet operation (48-52 db), sleek design and is user-friendly. 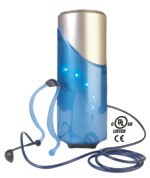 This unit provides the highest oxygen output of any non-medical personal oxygen/O2 concentrator. The Personal Portable Oxygen/O2 Bar Concentrator increases the oxygen content in the air using Pressure Swing Adsorption (PSA) Technology. The process centers around a molecular sieve. As air is introduced, it passes through the sieve and some nitrogen is removed. The remaining air containing 41% oxygen flows to a buffer tank and from there to the "Oxygen/O2 Headset".